Here's a great article, sourced from www.thestar.com, with some tips for things to do while touring Western Australia. If you're looking for camper hire in Australia, check out the deals at camperhireaustralia.com.au. "A sandalwood-infused scarf wreaths the body in its rich, but not overpowering, fragrance; the gongs vibrate into the very soul and stars send you into eternity. Letting go of all the stress you didn't know you had, it's easy to slip into a deeply relaxed, almost ethereal, state." 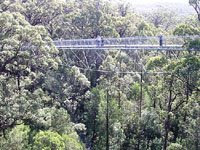 The story also goes into detail about Albany, a former whaling town with a whaling museum, and the "Tree Top Walk" (pictured) among giant trees, including Karri, Marri, Jarrah and the towering Tingle trees, found only near the town of Walpole. It's a worthwhile read that will give you plenty of ideas about activities while on your campervan holiday in Western Australia. Make sure you check it out.